Québec Vrai is accredited as to structure and procedures by the Reserved Designations and Added-Value Claims Board under ISO Guide 65, meeting its requirements for independence, competence and impartiality. Consumers are becoming more and more critical and the economy is globalizing. Globalization requires a willingness to accept social as well as environmental responsibility. The organic textiles market is continuing to grow, driven by increased consumer awareness of the risks that conventional textiles pose to human health and the environment. Although the conventional textile industry remains one of the most polluting in the world, organic textile production is not subjected to any government regulations. 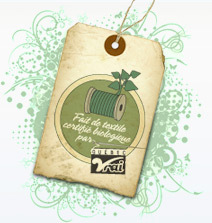 Québec Vrai has therefore decided to develop its own Organic Textile standard. The standard integrates all textile processing stages, from the fibre to the finished product. The raw fibre must be organic farming certified and all manufacturing processes must be inspected. There can be no organic textile without complete inspection of all the manufacturing stages, particularly the dyeing process, which is the most harmful to health and the environment. The use of chemicals is governed by stringent criteria. Decolouration or deodorisation on a support of animal origin, deterpenation, ethoxylation or propoxylation, irradiation, genetic engineering, sulfonation, treatments with ethylene oxide, synthesis via solvent extraction and bleaching by chlorine chemistry, are all prohibited. At least 95% of the fibres must be certified organic. 70% to 95% of the fibres must be certified organic. It’s a time of hemp diapers, bamboo t-shirts and shirts woven out of nettles! Synthetic fibres made from petrochemical resources, such as fleece, are experiencing inflation as a result of the sharp rise in crude prices. The composition of textiles is therefore undergoing a major change and organic clothing is flourishing. Alternative fabrics are not limited to the already popular organic cotton, and alternatives aimed at reducing the environmental impact of the textile industry, which remains one of the most polluting, are numerous: bamboo, hemp, pineapple, rice straw, or agricultural waste such as chicken feathers and sheep’s wool. So “Go Green” – Be eco-conscious and fill your closets with items made from these organic materials!